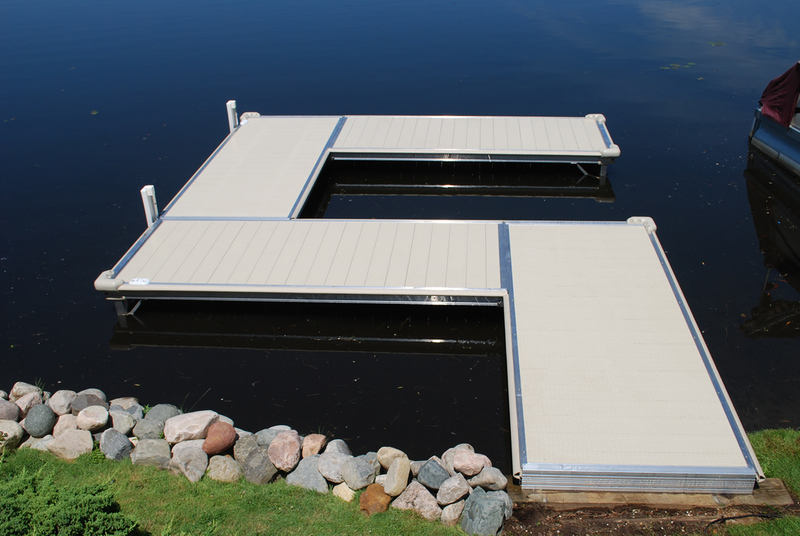 The combination of our streamlined profile, custom internal adjustable legs and built in colored vinyl bumpers gives your dock a progressive styling that will only enhance your waterfront property. Pre-assembled sections with our unique lip-lock design allows for a virtually “tool-less” installation & removal. Sections interlock together across the full width of the frame for quick & easy connections (no bolting). The Best Stationary Boat Dock on the Market. An innovative built in flexible “Vinyl” rub rail protects your waterfront from costly damages. The aluminum track in which it is housed also allows you to attach dock sections and accessories anywhere along the dock. Available in 5 colors: WHITE, BEIGE, GRAY, COBALT BLUE OR HUNTER GREEN. Double braced “internal” telescoping leg stands are mounted under the frame for a strong and unobstructed dock. Diagonal braces in both directions are standard, giving the dock a firm stance. Full length under deck aluminum supports are standard and add strength and rigidity to your dock frame. Our system lets you create any configuration that best fits your personal needs and allows for future changes and add on ability.